Aided by our accumulated industrial experience in this field, we are able to mesmerize our customers with fine quality. 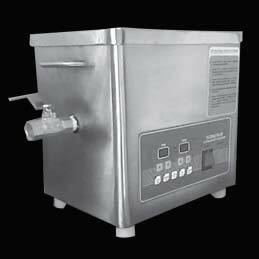 We offer Ultrasonic Cleaner Bath in a wide assortment. During manufacturing process, we keep a close watch to ensure its high performance. It boasts features such as automatic frequency tuning, Auto Degassing, Rugged and easy to clean stainless steel. The customer can get their hands on it by placing an order. Micro Controller base Digital Timer . Low transducer losses permit moximum cleaning action. Automatic priming - Low transducer losses permit maximum cleaning action. Standard Accessories - Plastic cover 1Pc. & Plastic Basket x 1Pc. S. NO. Cat No. Inside Chamber Size Cap. Ltr.